Trying to beat your speeding ticket or traffic violation in Metro Atlanta? You’ve come to the right place. While many view traffic violations as minor infractions and nuisances, traffic tickets and moving violations have the power to wreak havoc on your life. Fees quickly mount, and points from citations can cause your car insurance premiums to skyrocket or result in a revoked or suspended license. Traffic ticket attorney Sean Goldstein recognizes the seriousness of traffic violations and fights on your behalf to get your traffic tickets reduced or dismissed in Metro Atlanta and across the State of Georgia. While many view traffic violations as minor infractions and nuisances, traffic tickets and moving violations have the power to wreak havoc on your life. Fees quickly mount, and points from tickets can cause your insurance premiums to skyrocket or result in a revoked or suspended license. 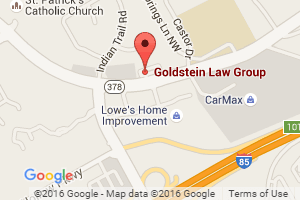 Attorney Sean Goldstein recognizes the seriousness of traffic violations and doggedly works on your behalf to get your Atlanta, Georgia traffic tickets reduced or dismissed. Atlanta Traffic Ticket Lawyer Sean Goldstein has developed a niche practice representing drivers charged with traffic violations in Atlanta. Because representing drivers in the metro Atlanta area with traffic tickets is our specialty, we have a high success rate at getting your traffic citations reduced or dismissed. We can save you money on your car insurance rates by getting your traffic ticket reduced or dismissed. We can save you time by going to traffic court for you to fight your traffic ticket. We can save you frustration by using our experience to contest your traffic citation so that you don’t have to guess what to do. If you’ve gotten a traffic ticket or speeding ticket in Atlanta, or anywhere in the State of Georgia including Gwinnett County, Dekalb County, Fulton County, Cobb County, or Douglas County, or in the cities of Atlanta, Alpharetta, Brookhaven, Chamblee, Doraville, Douglasville, Dunwoody, Duluth, Johns Creek, Lawrenceville, Marietta, Norcross, Roswell, Sandy Springs, or Suwanee, call us at (678) 757-5529 for a free consultation or Contact Goldstein Law Group online.